On June, 26, 2017 ⎯ Amnesty International announced its submission for the UN Universal Periodic Review of Republic of Korea(South Korea), 28th Session of the UPR Working group, November 2017. In this submission Amnesty International expresses its concern about the National Security Law (NSL), pointing out the NSL restricts on the rights to freedom of expression, association and peaceful assembly. And it criticizes that the government of Korea fails to protect human rights. In particular, it presents the imprisonment of former lawmaker Lee Seok-ki and the dissolution of the Unified Progressive Party (UPP) as representative human rights violations by the NSL over the past several years. Furthermore, Amnesty International urges the Korean government not only to abolish the National Security Law in order to guarantee freedom of expression and association, but also to unconditionally release all persons who were unjustly indicted and imprisoned. The unconditional release of Lee Seok-ki is required by the international community in accordance with international human rights standards. In addition, the international community has continued to propose the injustice of the dissolution of the UPP. The government of President Moon Jae-in that launched by the Candlelight Revolution should respond to such demands of the international community. Freedom of expression and association is a fundamental right guaranteed by the Universal Declaration of Human Rights. 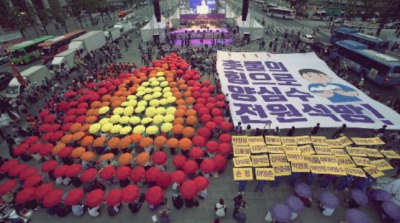 Currently, many prisoners of conscience including Lee Seok-ki and Han Sang-kyun were arrested on the reason that they had exercised these rights legally. Releasing all the prisoners of conscience is the first step to overcome the anti-humanitarian legacy of the former Park Geun-hye administration. Through it, Republic of Korea will be able to be reborn as an advanced nation of democracy and human rights that abides by international human rights standards. 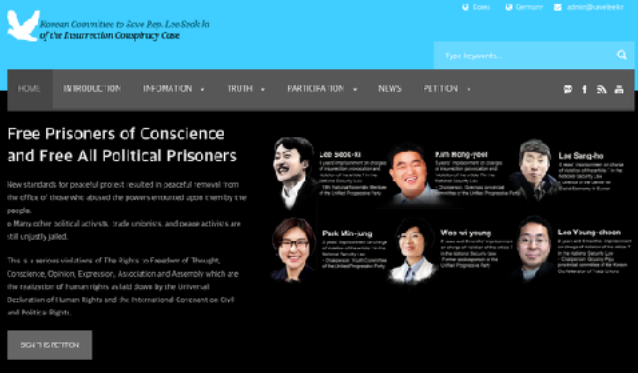 Among the cases of alleged breaches of the NSL during the last few years are the criminal prosecution and imprisonment of lawmaker Lee Seok-ki and six other members of the Unified Progressive Party (UPP). In December 2014, the Constitutional Court ruled to dissolve the UPP on the basis that the party had violated the country’s “basic democratic order”.14 This is a particularly alarming development, as it is the first time since 1958 that a political party has been disbanded in the Republic of Korea. Immediately and unconditionally release all individuals unjustly charged and sentenced to prison terms solely for the legitimate exercise of their rights to freedom of expression and association. 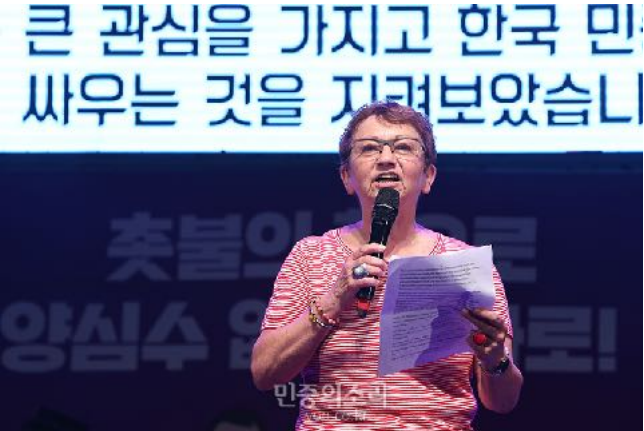 Inge Höger, a member of the Bundestag (The Left Party), visited Korea again after 2014. While staying in Korea, she had lots of meeting with people who struggle for the peaceful society. She made a remark for solidarity. Dear Ladies and Gentlemen! Dear friend! It is my honor to be present at this rally. Since last October I have been pursuing with great interest how here in South Korea millions of people have stood up against corruption and oppression. I am deeply impressed by the courage and determination which finally succeeded in compelling Park Geun-hye to resign. We, Europeans, can and should learn from these protests. Too much is also fundamentally wrong with us. I thank you for your tireless resistance. The candles in Seoul inspired people in other regions of the world! But we must never forget those who, before last October, have dedicated their health and freedom to struggle for justice. It is intolerable that people are treated as criminals because of their commitment to peace and social justice. And above all, let Lee Seok-ki free! He has been in jail for too long. Four years of Park Geun-hye have destroyed a lot in this beautiful country. To build a new democratic and peaceful South Korea we need the people who are still looking forward to their freedom. Democracy only works if nobody has to be afraid to be arrested for his/her political opinion and protests. That is why the fate of Lee Seok-ki is also a symbol of how democratic the new South Korea is. I have been a member of the German Bundestag for twelve years. I am the spokesperson for disarmament policy for my group in DIE LINKE. I have repeatedly criticized the German government for selling weapons to South Korea on a large scale. Last year alone, Germany sold almost $ 400 million to South Korea. I am firmly convinced that lots of weapons will no longer bring peace, but will increase the danger of war. This also applies to the deployment of the US missile system, THAAD, in South Korea. We all know that this not only increases the tension with the north but also with China! Let us fight together for disarmament and relaxation policy! The new arms race is dangerous! But it is also dangerous for the government, police and intelligence agencies to believe that they can control people’s thinking and prohibit access to books and information. As the representative of the left-wing group in the Committee on Human Rights of the German Bundestag, I often have to deal with violations of fundamental human rights. Still, I was really surprised when I heard that the representative of “Books of Labors” in Korea had been arrested. It is inconceivable to me that it is a violation of the National Security Act to upload and make books of Marx or Lenin. If the global school were to do so, whole departments would have to close down from universities. Such as economics, political science, philosophy, and sociology would lose essential foundations. These accusations are both ridiculous and deeply undemocratic. Reading and thinking are not crimes. It is a crime to prohibit this! It is time that the arbitrary national security laws are abolished! On the ruins of the World War, advanced international structures such as the United Nations emerged in the 1940s. In 1948, the General Assembly of the United Nations in Paris adopted a basic condition for protecting the dignity of every individual. Later, these conditions were concretized in the Universal Declaration of Human Rights. Those who assembled at that time agreed that freedom of expression, freedom of assembly and the right to organize politically are necessary mechanisms for protecting human rights. Unfortunately, we are still far from being able to implement these rights globally. In my home country too, fundamental political rights are always restricted. For example, the demonstrations against the G20 summit, which currently took place in Hamburg, were seriously banned. In a 34-square-kilometer area no protest may take place. Respect for democracy and human rights is also nowhere. Political liberties, social justice and peace can only be achieved together. Here in South Korea, Germany and global! Solidarity makes us all stronger! In this sense let us fight together for the release of political prisoners. Dear President Moon Jae-in, release Han Sang-gyun, the chairperson of the Korean Trade Union Confederation (KTCU). Leave the peace activists and war veterans free! And above all, let Lee Seok-ki free! 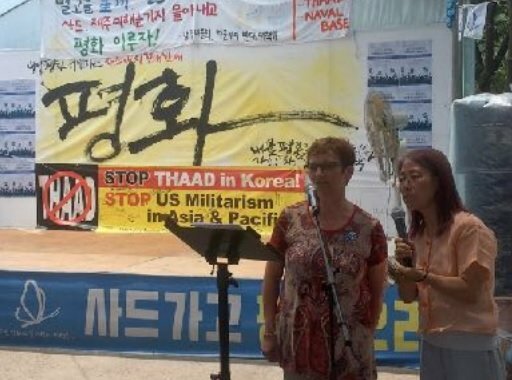 Inge Höger visits So-seong-ri to express her solidarity with the struggle against THAAD, July, 9. ⓒ Free Prisoners of Conscience, Korea. New standards for peaceful protest resulted in peaceful removal from the office of those who used the powers entrusted upon them by the people. Many other political activists, trade unionists, and peace activists are still unjustly jailed. This is a serious violations of the Rights to Freedom of Thoughts, Conscience, Opinion, Expression, Association and Assembly which are the realization of human rights as laid down by the Universal Declaration of Human Rights and the International Covenant of Civil and Political Rights. We really need your support and partnership. Through your help, we will be able to improve the situation regarding on human rights and peace in Korea. Here’s our banking account.